It is not possible to determine exactly when the Richland County Bar Association was organized. For many years it served simply as the vehicle by which court calendars were arranged, and twice each year it sponsored a party to entertain the visiting circuit judge. Prior to 1973, circuit judges were rotated regularly throughout the state. One visiting judge would serve from September through December, and another would serve from January through May. The Resident Circuit Judge would return to his home circuit and serve from June through August. Prior to the installation of air conditioning in the courthouse in 1956, however, no court was held in July or August because of hot weather. Even the June term was a difficult time to try cases because of the heat. The droning of electric fans and the rattling of window blinds from the flow of an occasional breeze through the open windows was soporific. Under the leadership of President N. Heyward Clarkson, Jr., in 1960, the Richland County Bar Association began the practice of having regular membership meetings, usually luncheons, with interesting speakers and timely topics. Below you can see the first composite of all of the Bar members - it was taken in 1968. When Clarke W. McCants, Jr. was President in 1973, various "sections" of the Richland County Bar were organized, implementing a concept of the previous President, R. Beverley Herbert, Jr. Many of the sections failed to continue, but two, the Real Estate Section and the Estate Planning, Probate and Trust Law Sections, have functioned regularly with meetings and interesting programs. In 1975, when John Gregg McMaster was President, the Richland County Bar Association was chartered as a corporation. The Association operated a Lawyers Referral Service from June 1975 to June 1977 when this function was taken over by the South Carolina Bar. The RichBar News was first published on May 30, 1973, and was edited by James H. Quackenbush, Jr. Only a few issues were published that year, but beginning in 1974 it was published on a monthly basis and is now published bimonthly. Click here to read the latest newsletters. With Hoover C. Blanton as President in 1980, the Association began the practice of conducting a "free lawyer" clinic to celebrate Law Day. This program included thirty minutes of free initial consultation for any member of the public and free wills for persons over 65. This effort met with huge success and was repeated regularly for many years. In the last decade the Association has grown rapidly. An office was opened and the organization’s first Executive Director was hired. 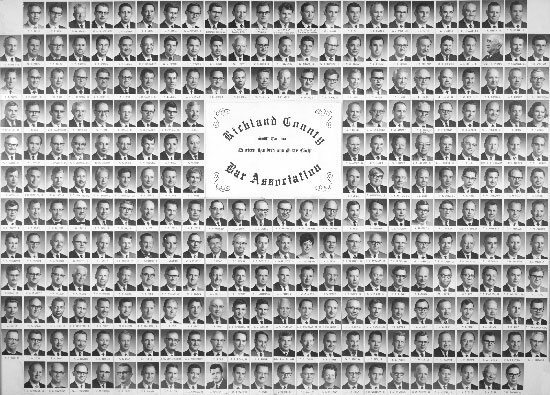 In 1981 the Richland County Bar Association membership stood at 760 and by 1987 membership exceeded 900. In 1999 the Richland County Bar Association had nearly 1800 members and today’s membership is just under 2000. There are numerous committees which strive to promote effective communications between members and the judiciary, foster friendships among members through social activities and provide opportunities which promote education, awareness, volunteerism and civic responsibility within the legal community.